Under Article 51 of the New York Law Insurance Laws, one is protected in the State of New York under “No Fault.” The purpose of this law is to make sure that insurance companies pay for medical expenses, lost earnings, and incidental costs that stem from a car crash regardless of who was at fault in the crash. Another purpose behind this law is to help the injured person without a long litigation debating over who was at fault to the crash. In New York you are protected under No-Fault coverage, because New York is one of the 12 states that have this protection. Please note that No-fault is a different claim than one of bodily injury. You also have the right to sue for injury but that claim would be called a bodily injury claim. Bodily injury, if your were injured, is a separate claim that will be filed against the person who is responsible for causing the crash, resulting in your injury. No fault claims and bodily injury claim each have separate adjusters, come from separate departments, have different standards of proof, compensation and coverage. One of the only things that are the same is both will be paid out by the same insurance company. No fault in New York, is in place to make sure that one’s insurance company, regardless of who is at fault, will pay for economic losses, up to $50,000. The expenses are usually related to medical bills, and physical therapy that stems from your injury. It can also include lost wages. What is No-Fault coverage and what am I entitled to under it? The accident must have occurred in NY. The person who is injured must be the driver or the passenger of the insured vehicle. If you are a cyclist or a pedestrian you must have been struck by or came in contact with a motor vehicle which caused your injuries. If you were hit by a motorcycle you will not be covered. Vehicle, must be registered in New York and the vehicle must have an insurance police sold by NY or issued by a company licensed to do business in NY. Please keep in mind, you only have 30 days from the date of the accident to fill out a no fault application. There are forms that need to be filled out in order to start a No-fault claim. So, please contact us if you believe that we can help you with a no fault claim. 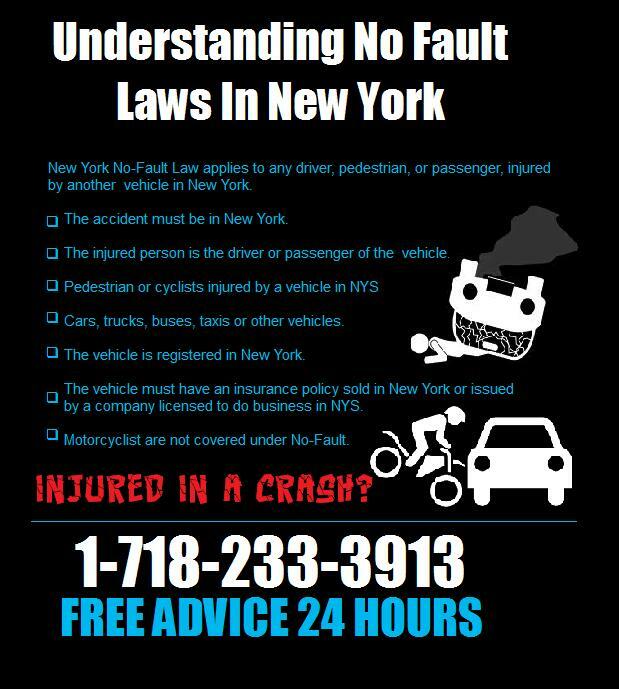 If you have been injured in a car accident in New York, and have questions regarding No Fault insurance, contact New York personal injury lawyer Paul Ajlouny.